Long time readers of Wake up America know I am fascinated by the weird and unusual, so this latest finding was guaranteed to catch my interest. 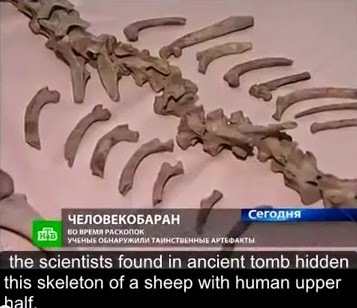 Weird, strange, unusual and inexplicable are the first words that pop into the head with this Russia news item, translated into English in the subtitles in the video below, of remains found in Russia that have scholars mystified. 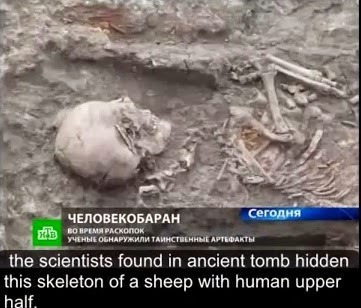 The remains appear to have a sheep’s body but a human head and/or upper half. The title on the video uses the term “Satyr,” which is not technically correct because the in Greek mythology Satyrs have faces and bodies like men and ears, legs, and tails like goats, but the concept is still an animal body and a human head. Coincidence of all coincidence, the report says the other finding was close to Crimea.